We offer a great selection of traditional French cuisine food and wine list at a very attractive price. Discover the fresh, innovative style of Kew’s most popular restaurant. 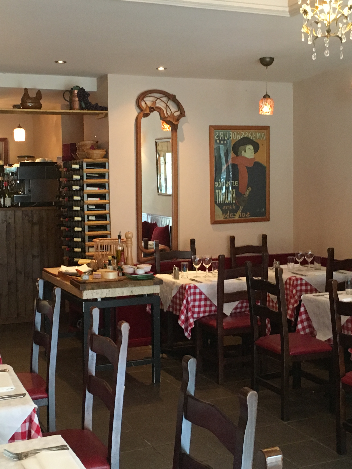 Located in the former post office near Kew Gardens train station, this lovely building of Townscape Merit provides an ideal setting to enjoy delicious French food and wine in a relaxed and informal atmosphere. Based on a traditional 1950s French bistro, the black and white tiled floor, French impressionist posters and gingham tablecloths were selected to evoke the perfect environment to enjoy French cuisine at its best. Today it has evolved and grown into a traditional bistro perfect for lunch and dinner. We invite you to experience Ma Cuisine restaurant, renowned for its authentic French cuisine. We look forward to sharing our passion for good food and service with you, and welcome you as our guests. Eating out at Ma Cuisine Kew is always a relaxed and convivial affair. The friendly environment of our 60-seater restaurant and the stylish blend of classic French dishes is a clear favourite. We can offer everything from mid-morning beverages and light lunches to seasonal dishes and comphrehensive dinner menu, complemented by a reasonably priced wine list. We are proud of the time and effort that goes into preparing each of our dishes and look forward to serving you. At Ma Cuisine you will enjoy world class wines, French cuisine and classic French desserts. Ma Cuisine Kew caters for a wide range of appetites with baguettes and salads plus a menu rapide at lunchtimes as well as a full a la carte menu in the evenings. The menus are complemented by a good selection of wines, beers and soft drinks. On those warmer days, you can soak up the Kew village atmosphere by dining al fresco at the front of the restaurant or in our small terrace to the rear of the building.